The Pew Internet Project has been tracking internet users’ participation in online activities since we began polling in March 2000. We have asked about nearly 94 web activities over that time. Two of them, email use and news gathering, have been included in every survey. We have polled other activities intermittently, from about 6 to more than a dozen times. We have added new activities along the way, as uses of the internet have evolved. 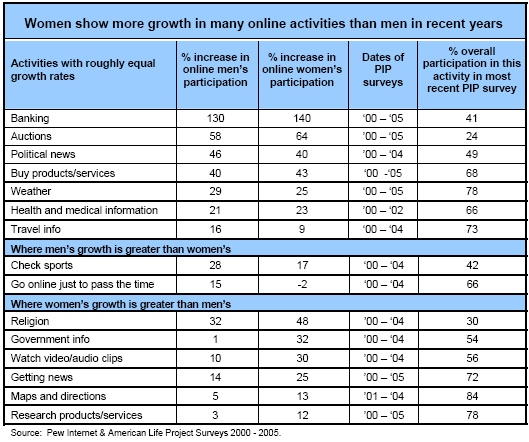 While men and women both use the internet to do lots of their activities, men do more of them than women. There are some variances that are worth noting. Men and women are equally likely to do many online activities. Men and women are about equally likely to engage in many of the activities we have polled. They include: using a search engine, getting information on travel, jobs, places to live; finding phone numbers, addresses; doing research for training or school, or finding information from the government; buying products and groceries online, making travel plans or purchases; banking online, giving to charity, paying bills, although men have been leading the latter lately. Both men and women do instant messaging, and exchange invitations. Men and women are about equally likely to go online to listen to music, and watch videos. Sharing files has a more volatile history. First men did this more often, and now women do. Finally, men and women are equally likely to go online for no particular reason and to play online games. Women lead online activities in some areas. Women are significantly more likely to send and receive email, to search for maps and directions, and to get religious or spiritual information. 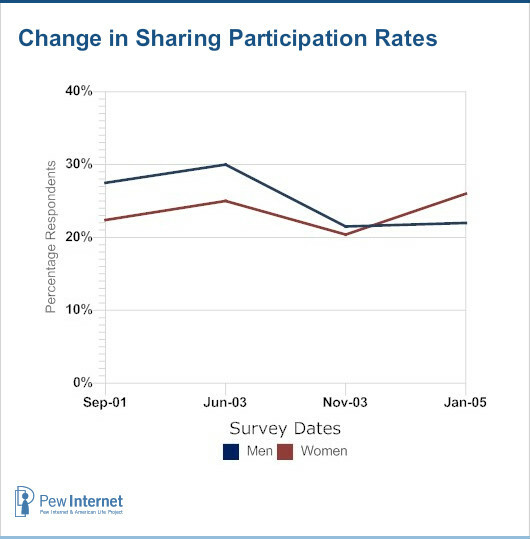 Over time, women have consistently engaged more in health-related online activities. They are significantly more likely than men to look for general health and medical information, as well as information on specific diseases or medical conditions, treatments or procedures. They also are more likely to look for support groups to communicate with for diseases or conditions. 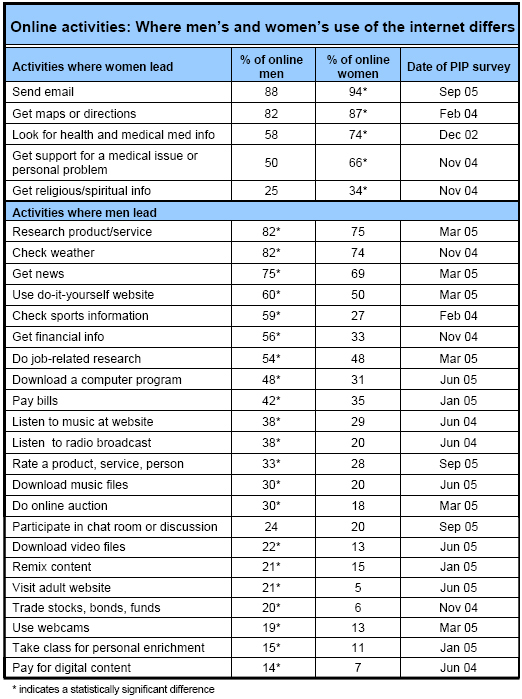 In November 2004, we polled users more extensively on a battery of specific health related activities. We found women were more likely to look for information on diet and nutrition, on how to quit smoking, and on mental health issues, including depression, anxiety, and stress. 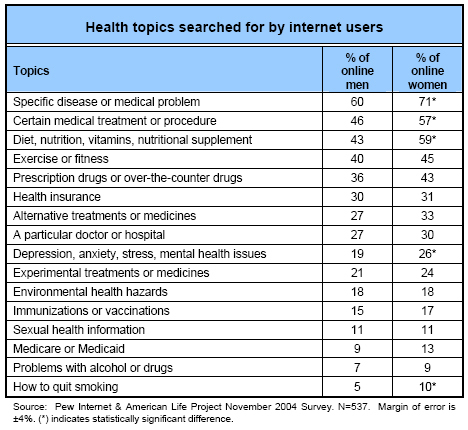 In some cases, men and women were about equally likely to do online research: to look for information on health insurance, a particular doctor or hospital, experimental treatments or medicines, environmental health hazards, immunizations and vaccinations, sexual health information, and problems with drugs and alcohol. In December 2002, women were also more likely to email with friends or family about health or medical issues. Men have traditionally been more likely than women to get news from the internet. They also are more likely to get information on sports, financials, and weather, where men have recently increased the spread. More men than women do research online for their jobs and research products or services. Men are more likely to trade stocks online, to participate in online auctions. They participate more in chat rooms and discussion groups. They are more likely to look for hobby information, do-it-yourself websites, and they visit adult websites. They download music, videos and games more than women, as well as listen to more music, and use webcams. Trends in participation in online activities. 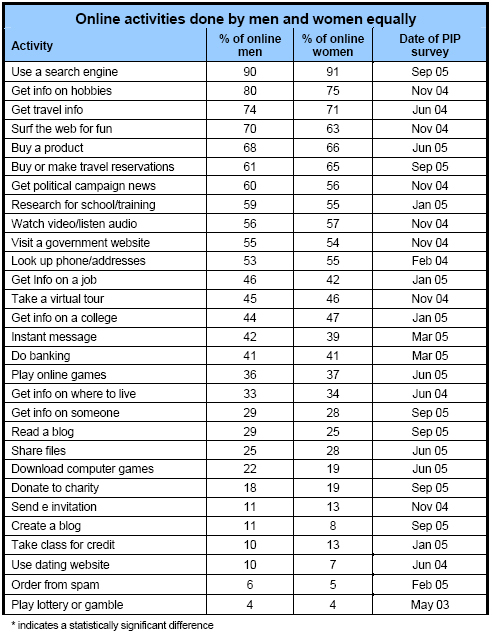 There are about 15 activities that have grown demonstrably in popularity since we began tracking them in 2000. For some, men and women both have increased their participation rates similarly; for most others, women have leapt forward. Several activities have become more popular among both men and women. The runaway leader was online banking, where participation rates more then doubled, from 17% to 41%. The others include auctions, gathering political news, buying products and services, checking the weather, looking for health and medical information and also making or booking travel arrangements. Activities where growth has been greater for men. 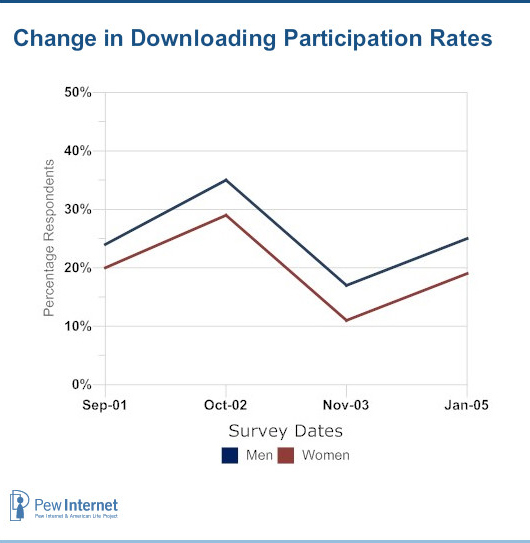 Men’s participation rates increased more than women’s for checking online sports scores, where they have always lead, and going online just to pass the time, where men grew 15% and women actually dropped by 2 points. Activities where growth has been greater for women. Women have gone online at faster rates to close the gap with men in getting information on government and in watching audio and video clips. They have grown to overtake men’s participation rates in getting maps and directions. They also increased their lead in seeking religious information. They have narrowed the gaps with men in seeking general news and in researching products and services. In one dramatic exception, participation rates have fallen, entirely due to women. The proportion of internet users who have participated in online chats and discussion groups dropped from 28% in 2000 to as low as 17% in 2005, entirely because of women’s fall off in participation. The drop off occurred during the last few years coincided with increased awareness of and sensitivity to worrisome behavior in chat rooms. For two final activities, we have tracked much fluctuation: In September 2001, we asked both about downloading music files and sharing files with others. Some 26% of users overall downloaded music files and 25% shared files. Two years later, in November 2003, following publicity challenging the legality of downloading and sharing, numbers dropped dramatically. Downloading numbers, having risen as high as 32% in October of 2002, plummeted to 14% of users overall. Similarly for file sharing, having risen to as high as 28% overall, fell to 20% overall. Our last measure, in January 2005, the numbers crept back up again to 22% overall for downloading and 24% for file sharing.